Maloncho or Alligator weed (alternanthera philoxeroides, amaranthaceae) is an aquatic or semi-aquatic perennial herb rooting at nodes. Stem is juicy, slender and hollow. So the plant can easily float on the water. Though the floating plant is found everywhere in Bangladesh, surprisingly it is native to Brazil. In the far past it has been introduced to the subcontinent and Southeast Asia. Flowers are very small, white, on head inflorescence, petals 5. Peduncle is very long. Leaves are green, slightly serrated, linear, elliptic-lanceolate, 3-8 cm long, opposite, acute at the end. Fruit an utricle, ovoid-orbicular or obcordate. Seed is inverse, lenticular, single-seeded. 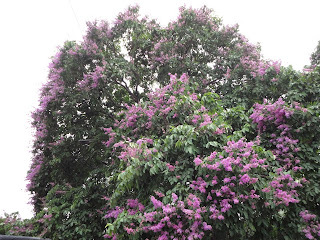 Flowering occurs in the rainy season. Propagation is caused by cutting or seeds. It grows in damp places, near pond and canal etc. Leaves are eaten as vegetables. It is energizing, emollient and reputed to induce sleep. It can be found in shallow and stagnant water in beel-jheel, ditches and ponds. The another Bangla name of the plant is Heycha.